I would venture a guess that these contraptions aren't used anymore. Oh the purple ink and damp paper , and yes, the smell. Kept in its own room at Anne T. Case Elementary school in Akron. 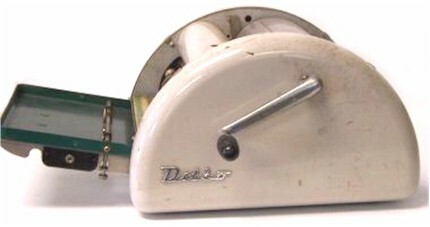 From Duff's description our school had a Ditto copying machine (the ink was a reddish blue) but the teachers and kids called it a mimeograph. Probably a catch-all term like Kleenix is today. I remember enjoying the smell of a freshly printed copy. MMMmmmmmmmm! Right. Ditto copies involved a two-sheet master; when you typed on the white top sheet, colored wax (blue, in my experience) from the second sheet would adhere to the back of the first sheet. You'd then remove the second sheet, place the first sheet on the drum (wax outward) and turn the crank. It used smelly alcohol-based ink, and the copies it produced were in blue (or whatever color the wax had been?). For more info, see the "Spirit duplicator" entry in Wikipedia. Mimeograph machines also used a two-sheet master, but the top sheet was a sort of waxed paper, and typing on it produced a cutout stencil that you'd mount on the machine's drum. Ink would be forced through the stencil onto the copies. This made black copies (assuming the ink was black). For more info, see Wikipedia's "Mimeograph" entry. You could use a typewriter to produce either sort of master, but I believe only the ditto would handle drawings very well. Someone please educate me. These are different from mimeograph machines? Is this the machine that would make the copies in that blue ink?? Sniffffffffffffffffffffffffffffffffffffffffffffffff! Oh, that wonderful smell! !